Gather your family & friends and “escape” to this spacious lodge. The panoramic views are stunning at this gorgeous three story vacation rental. The open concept living room, dining area and kitchen are the perfect set up for a large group. The main floor has a 12 person dining table with Windsor chairs and a breakfast bar. The kitchen is updated with high-end appliances, cookware and tableware. In the living room, you will find a large flat-screen TV and leather seating. The lower level of the property provides a game room and a home theatre with cinema chairs. There are three covered decks and a hot tub; Perfect for outdoor entertaining. Not only does this vacation rental provide you and your guests excellent amenities, it places you in the heart of The Great Smoky Mountains. The Great Escape II is part of the Gatlinburg Falls Resort which means guests have free access to the outdoor pool. Explore downtown Gatlinburg and go hiking in the surrounding mountains. After a full day of hiking, exploring or skiing, come home to your cozy lodge and relax in the hot tub. There are a total of 5 bedrooms (3 upstairs, 1 on the main level, and 1 downstairs). Each bedroom has a luxurious king-size bed and a TV. Three of the bedrooms even have their own cozy fireplaces. Three of the bedrooms also have their own access to a deck. Just off the each bedroom is a bathroom. Have additional guests? There is plenty of room in game room and living area. Each space has a sofa that opens up into a queen-sized bed. Kids love the sleeping nook tucked away upstairs with a twin bunk bed. Throughout The Great Escape II, you will find many unique amenities. Guests of all ages love the game room which includes a regulation-size pool table, a multi-game arcade, pinball, air hockey, a Golden Tee golf arcade game, and a large-screen TV. Don’t forget to check out the home theatre where 15 people can enjoy a movie in the cinema-style chairs. The location of this Tennessee mountain lodge is also unique because of easy access to The Great Smoky Mountains and the fresh mountain breeze. 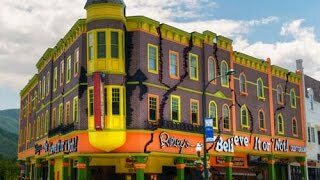 Only a short drive from downtown Gatlinburg which offers thrill rides, aquariums, restaurants, shops and the Guinness World Records Museum. Being only a few minutes away from the heart of Gatlinburg allows you and your guests to “have it all”. Gatlinburg has outdoor adventures, laid back scenic charm, kid friendly attractions and world class fishing & hiking. Did you know that there are 600 miles of hiking trails in The Great Smoky Mountains? Don’t forget your hiking shoes. Other popular activities include zip lining, snowboarding, tubing, whitewater rafting, horseback riding and biking. 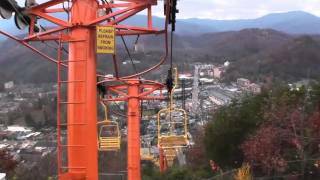 Looking for fun winter activities in Gatlinburg? Ober Gatlinburg is open from December to March and is one of the most popular skiing destinations. They offer equipment rentals and a variety of slopes. They also have a 9 lane, 400 foot snow tubing park and a massive indoor ice arena. Your trip isn’t complete until you experience an evening at one of the live shows in Gatlinburg. There are over 100 restaurants with ethnic cuisines, southern-style meat and everything in between. The local breweries, distilleries and wineries have a glass with your name on it! There are adventures around every corner when you stay at The Great Escape II! Final pricing will include fees in addition to rent; including an end of stay cleaning fee, non refundable damage waiver, booking fee, local and state tax and community application fee (on select communities). *** All fees will be provided prior to booking.